Jordan Chan in yet another triad flick? Yes, while his buddy Ekin Cheng has pretty much retired from such roles after the Young and Dangerous series, Jordan Chan appears content to reprise a similar role every once in a while. The good news is that Hong Kong Bronx is no dud, unlike this year’s dismal Fatal Move. But Wong Jing’s name on the producer’s credit should also tell you that this will be no classic either. Instead, Hong Kong Bronx ends up being characteristic of many such mid-range works- a guilty pleasure to watch but ultimately forgettable. As if a nod to his age, Jordan Chan plays Sek Shi Ding, once a big time triad member who has spent the last eight years of his life behind bars. These eight years have made him a reformed man, and upon his release, he wants to start a legitimate business with his buddy Faye (Timmy Hung). He also wants to dedicate his time to taking good care of his two sisters, Bonnie (Vonnie Liu) and Barbie (Ada Wong). In short, he wants nothing to do with his past life. But naturally, Neil’s attempts to sever his connections with the triads will be thwarted. An impending election is coming up and the elders feel that Neil is the best candidate to take over. They do not want power-hungry Johnny (Chan Bo-Yuen) to assume the post. Gradually, Neil finds himself sucked back into the vortex of his past. There is also another parallel story of Bull (Kenny Wong), a truck driver who wants a honest and simple life. But his son is bullied into joining the triads and his girlfriend owes the triads money. A chain of events will lead Neil and Bull to take on the triads in a violent bloodletting climax. And indeed, Hong Kong Bronx represents an emerging trend in triad movies of late, involving more violence and copious amounts of CGI blood. There is much of each to be had here as well, but the ever vigilant censors have once again exercised their better judgment especially at the climax which turns out to be as horribly mauled as that in Fatal Move. As with all such movies, there are themes of loyalty and brotherhood here especially with Sek and his buddy Faye. Although there are moments of melodrama, they are thankfully balanced with an always watchable performance by Jordan Chan. You could go as far as to say that he has mastered the role of the reluctant and reformed ex-triad member whose past catches up with him. Whether intentional or not, Hong Kong Bronx feels like it was shot cheaply on handheld DV cameras. Perhaps that is director Billy Chung’s idea of lending the film a gritty feel. Regardless, it does take a while to get used to the slightly bleached colours in the day, and the overexposed look at night. 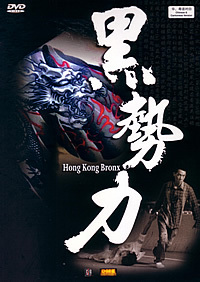 All in all, if you lower your expectations, Hong Kong Bronx still is fun to watch. There are many elements which are basically a retread of the genre, but hey if you’ve enjoyed them before, you’ll still enjoy them here. The audio track comes in Chinese and Cantonese with both English and Chinese subtitles. Choose the Cantonese track for a more authentic feel. Visually, the film looks like an amateur home video at times, but that is due to the nature of the film than the transfer to disc.